I recently discovered how easy it is to make panna cotta (see THIS POST for a panna cotta topping recipe) and have to admit I’ve made it several times since. As well as being easy it is also a cheap dessert to make, yet super tasty and perfect for all occasions. 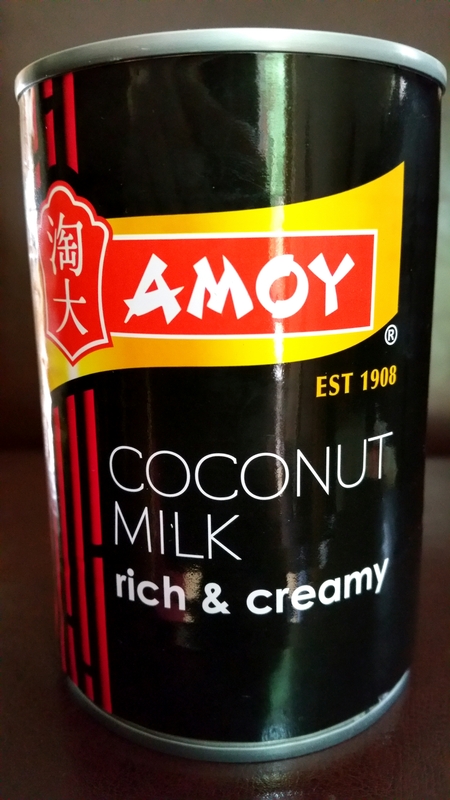 In the June Degustabox, one of the items I received was a can of Amoy Coconut Milk. I instantly had 2 ideas for yummy desserts to turn this in to…. coconut cheesecake, or coconut panna cotta. My new-found love of the latter won. There is a bit of an art to making a perfect panna cotta, in that it contains gelatine. Too little and you’ll have a splodge of unset cream on your plate. Too much and you’ll end up with a rubbery blob you could bounce off the walls. (Not that I’ve tried that!!!) To make the vanilla one I used in the recipe I’ve linked to above, I followed Simon Rimmer’s recipe which can be found HERE. Every one I’ve made since has used the same basic recipe but changing the flavours. This coconut one is also based on that recipe. The amount of gelatine he uses gives a perfect result every time, as long as you keep the liquid ratios the same. It holds it’s shape perfectly yet when you break into it with your spoon, it is deliciously soft and creamy. This coconut version tastes so good with or without the ginger, but I just wanted to add an extra depth to it. The orange sauce goes beautifully with it all. I made my sauce very thick but you can choose how thick you want it and adjust the simmering time accordingly. I hope you enjoy this as much as I have! Place the gelatine leaves in a small bowl and cover with cold water while preparing the next stage. Place the cream, coconut milk, sugar and ginger into a pan. Mix together, then heat gently until just starting to simmer. Remove from the heat. Squeeze the gelatine leaves to get rid of as much water as possible. Throw away the water. Add the gelatine to the pan and stir until it has completely dissolved. Pour the mixture equally into 4 ramekins, and leave to cool. When cool, place them into the fridge to set. The longer you leave them the better, but at least 3 hours is ideal. (Overnight is fine too). To make the sauce, place the orange juice, sugar and butter in a small pan and bring to the boil. In a small cup, mix the cornflour with a litle bit of the hot orange mixture until it is smooth and lump-free. Remove the pan from the heat, pour the cornflour mix into the pan and stir well. Bring back to the boil and heat until it is the consistency you require. The longer you heat it, the thicker it will get. (It will also thicken a bit more as it cools). Leave to cool. To unmould the panna cotta, carefully run a sharp knife around the edge, and then dip the ramekin into hot water for around 10-15 seconds, making sure no water gets in to the ramekin. Turn the ramekin upside down on to a plate and give it a gentle shake. The panna cotta should slide out. If it doesn’t, just dip it into hot water again for another 10 seconds. When you dip it into the hot water it will cause the outer edge to melt slightly, which will make it slide out. 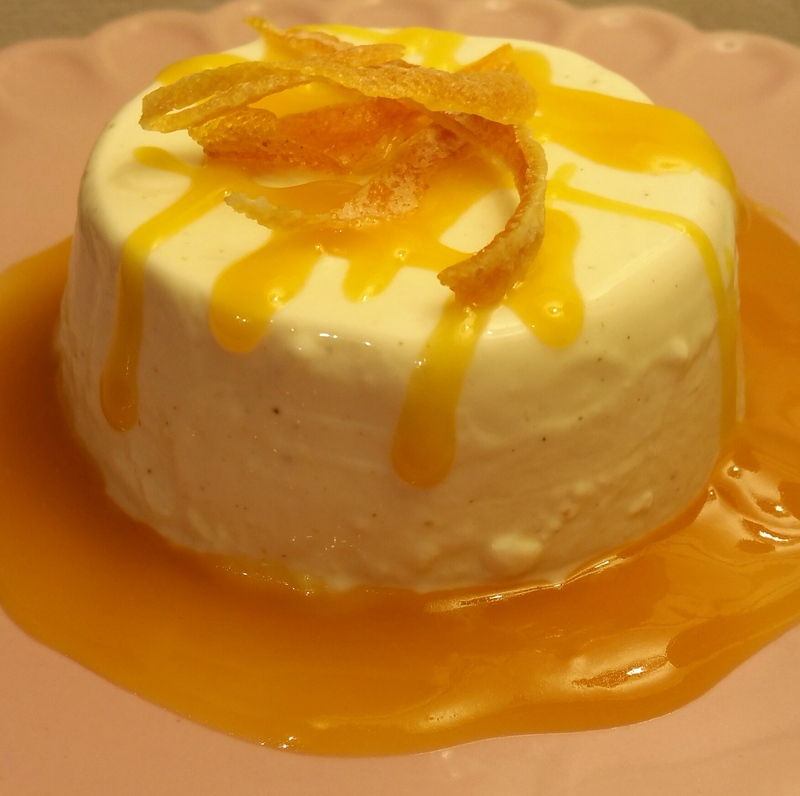 Use a spoon to drizzle some of the orange sauce around the panna cotta, and some over the top too. Enjoy! I served mine with crystallised/candied orange peel, which I made using THIS RECIPE. The beauty about this dessert is you can make it in advance. I tend to make panna cotta the day before I actually want it. Don’t unmould it until you will serve it though. Enjoy!